Thrillers and spy fiction have not recovered from the fall of the Berlin Wall in 1989. On the frontier between East and West Germany, two different ideologies rubbed against each other, steel and stone, and if a spark was going to set off a worldwide conflagration, chances were good it would be struck there. Len Deighton, Ian Fleming, Ross Thomas, and John le Carré all took advantage of those high stakes in writing their classic novels. So for my next book, I wanted to find the equivalent trouble spot in the contemporary world. Where, I asked myself, are two civilizations colliding today? Is there another line that divides two worldviews, so fraught that a misstep could lead to a cataclysmic clash between civilizations? That question was not hard to answer--Israel’s border with its Arab neighbors. OK. I’d never been to Israel, and it was time to go. My son was 9 years old and ready for adventure. I read plenty about the area before going, in order to get my imagination revved up. Two thrillers stood out. Lionel Davidson’s fabulous, but largely forgotten The Menorah Men (1966) played around with the idea of uncovering the ancient menorah of the Israelites. The Alexandria Link (2007), by the redoubtable Steve Berry, suggested that Solomon’s Temple wasn’t even in Jerusalem. For 10 days after our arrival in Israel, my son and I traipsed up and down the country. We went up to the Golan Heights. Through binoculars, we watched Hezbollah riflemen across the border in Lebanon pointing their Kalashnikovs at us. But being a target did not encourage any plots to pop into my head. We traveled to Tel Aviv and saw where David Ben-Gurion declared Israel’s independence on May 14, 1948. Six countries greeted that announcement, approved by a vote of the United Nations, by invading the brand-new State of Israel. Leon Uris’s Exodus (1958), which had made such a huge impression on me in eighth grade, tells that story. I really couldn’t find anything left for my potential thriller. We went up to the top of Masada, where Jewish Zealots opted for suicide rather than submission to the Romans. (It’s where many Israeli combat soldiers get sworn in today.) While my soul cringed to think of the Roman war engines moving forward to crush fighters for religious freedom, the writer in me wondered what if a modern-day discovery showed there had been no mass suicide, that the Zealots had escaped to fight another day? I marked that idea down as a possibility. 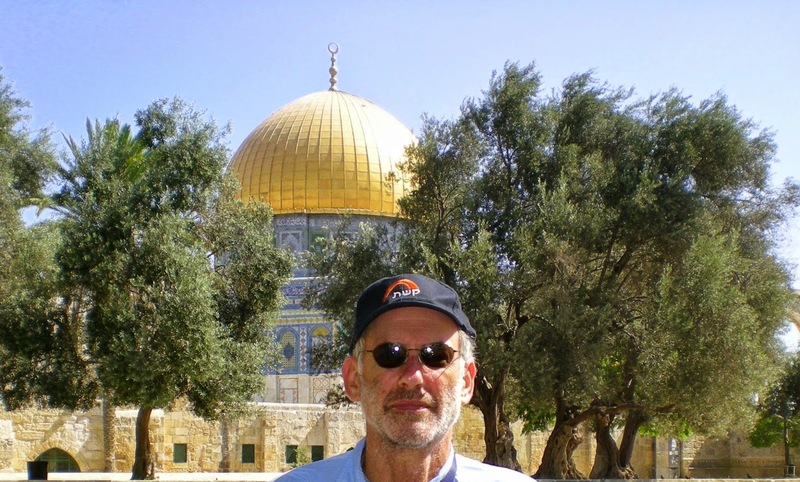 Author Keith Raffel on Temple Mount. Finally, we arrived in the holy city of Jerusalem. Still, knowing I was going to use claustrophobic panic in my book was far from finding a story. A day or two later we were scheduled to walk in another tunnel, one that ran underneath the Kotel, the Western Wall. I sucked it up and, heart pounding, got ready to descend again. Thank the stars, this tunnel was wider. We marveled at the size of the stones that made up the Wall. How had the ancients moved the Western Stone, which weighs 570 tons, into place? In a nook in the tunnel, a huddled coterie of a half-dozen women prayed at the point closest to the Holy of Holies, the room in Solomon’s Temple where the Ark of the Covenant was ensconced. And why was the Ark so holy? Because it held the tablets Moses is said to have received on Mount Sinai. So my son and I continued moving along the tunnel until we came to a circle of concrete amidst the massive stone blocks. I asked what it was and learned of two prominent rabbis who believed the Ark of the Covenant had been hidden in a shaft under the Holy of Holies when the Babylonians conquered Jerusalem 57 centuries ago. The rabbis drilled and dug at night. But the Muslim authorities on the surface of the Temple Mount felt the vibrations of the jackhammers. They complained to the Israeli authorities who, fearing violence, put a stop to the midnight digging and plugged up the excavation. OK, then. The magical two-word question for any thriller writer is “What if?” What if, I asked myself, the two rabbis had seen the Ark, before their excavations had been plugged up? And then, what if our hero’s grandfather had been with those rabbis and also seen the Ark? I was off and writing. At the opening of my new novel, Temple Mount, Alex Kalman has sold his high-tech company in California’s Silicon Valley and is wondering what to do with his life. The phone rings. On his deathbed, his estranged grandfather tells him he has seen the Ark under the Temple Mount. 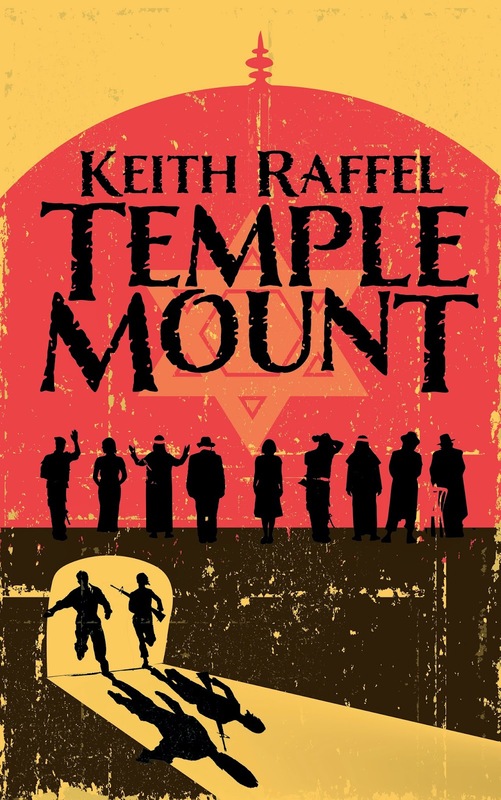 Kalman embarks on a quest that takes him from Washington, D.C.’s corridors of power to the ancient passages under Jerusalem’s Temple Mount. Finally, Americans, Arabs, and Israelis agree on something--the need to stop Alex Kalman. The trip to Israel my son and I took left me with great memories and two souvenirs, my fifth novel and a lingering case of claustrophobia.